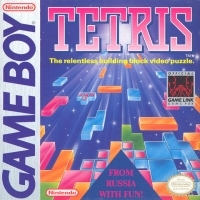 Description: Launch Title, Pack in with the original release of the Game Boy. 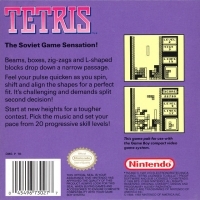 Box Text: The Soviet Game Sensation! Beams, boxes, zig-zags and L-shaped blocks drop down a narrow passage. Feel your pulse quicken as you spin, shift and align the shapes for a perfect fit. It's challenging and demands split-second decision making! Start at new heights for a tougher contest. Pick the music and set your pace from 20 progressive skill levels! 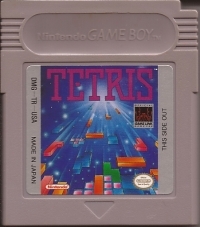 This is a list of VGCollect users who have Tetris in their Collection.